Emma began to plan for a visit to England, though her people were fearful that she would not return – King Kamehameha II and his Queen had died while on a visit to England. In May 1865, she departed the Honolulu harbour and arrived at Southhampton on 13 July. She undertook several engagements and had an audience with Queen Victoria, who had also been her son’s godmother. On 9 September, they met in the white drawing room of Windsor Castle. Queen Victoria later recorded, “After luncheon, I received Queen Emma, the widowed Queen of the Sandwich Islands or Hawaii, met her in the Corridor & nothing could be nicer or more dignified than her manner. She is dark, but not more so than an Indian, with fine feathers (features?) & splendid soft eyes. She was dressed in just the same widow’s weeds as I wear. I took her into the White Drawing Room, where I asked her to sit down next to me on the sofa. She was much moved when I spoke to her about her great misfortune in losing her only child. She was very discreet & would only remain for a few minutes. 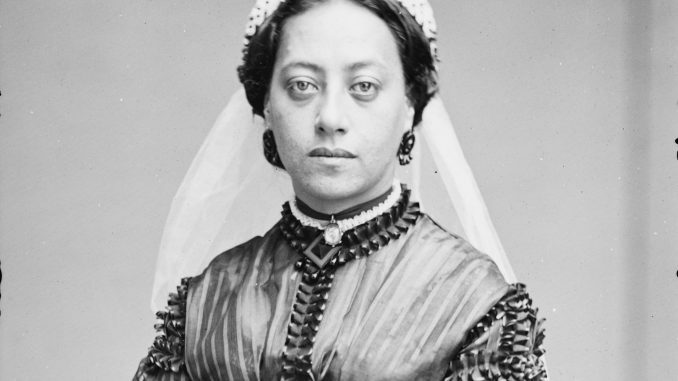 She presented her lady, whose husband is her Chaplain, both being Hawaiians…” Later that year, Emma was invited to stay overnight at Windsor Castle where she also met the Princess Royal and her husband. At the end of the year, Emma travelled on to France for her health. While she was going around Europe, the heiress to the throne, Princess Victoria died. 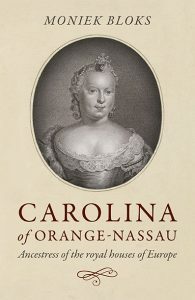 The King was a bachelor and could still father an heir, but now Emma also came into the picture as a possible successor. At the end of July 1866, Emma departed for the United States and arrived on 8 August after an extremely rough crossing. She went by train to Washington to meet with President Andrew Johnson. After an absence of more than a year, Emma finally returned to Honolulu on 22 October 1866. She arrived to an unexpected offer of marriage – that of the King. She turned him down gently, saying she had religious scruples. The King would die just five years later, and the people anxiously awaited the naming of his successor. He may have preferred Emma, but he passed away on 11 December 1872 without naming an heir. Without a direct successor, a new sovereign would need to be elected. Emma did not make any effort to put her name forward. Eventually, Lunalilo was elected King. Emma had known him since they were children. Once again, there were rumours that she would marry the new King. His reign was to be short, and he died just over a year after his election. This time, Emma was more interested in becoming the next sovereign. Once again an election had to be held, and Emma actively campaigned for votes. In the end, she lost to Kalākaua who became the next King. Emma was disappointed and only begrudgingly accepted him as sovereign. Emma became known as the leader of the opposition, and there were several conflicts with the new King, his wife Kapiʻolani and his sister, the future Queen Liliʻuokalani. However, Emma remained popular with the people. Despite all of this, Emma remained surprisingly active. In 1881, she came down with smallpox and had to be quarantined for months. Several of her servants did not survive. In 1883, Emma – who had otherwise always been quite healthy – had suddenly suffered a seizure. She recovered but remained weak. In July 1884, she had another seizure as she got off her horse. She suffered from memory loss, was paralysed and could not see out of her right eye. Emma realised her own mortality and began to write her will. On 2 January 1885, she celebrated her 49th birthday with a large reception and appeared in good spirits.